Re: Flash_19's Maps & Scenarios: New Map 9/19/18! Thanks Kolakoski! I always appreciate your kind words about my maps. See Hoard of the Dragon. What do you think? So, I've been sitting on a few maps that I haven't been able to play test yet. But, I'm finally getting some guys together to play in a week. I'm trying to figure out which map to play test first. Any thoughts or feedback based on what you see? This first one is pretty simple - feels similar to highways and dieways. I'm wondering if it feels a little too vanilla if you know what I mean. I'm still deciding if I really like this one. I was going for something different than my usual. Treasure glyphs are in the middle by the rock outcrops. This map is all about trying to make the bridge in the middle work... I like bridge maps aesthetically, but I think they are hard to pull off in a balanced map. Still debating between power glyphs or treasure glyphs for this one. -Map 1: Yeah I think the map works way better opening up each side so the ruins don't cramp you in. Before the added road on the sides, the middle could just get clogged too easily with rats/screens. I think I would change the tree closest to each start zone (to each start zone's right, the one that's touching one of the spaces), and put each adjacent to their respective big trees in the middle. I think there'd be more cover this way. But, it's pretty minor and really just a slight preference, both work in my opinion. Also I haven't played on any of these maps, of course. So just opinions at a glance. Edit: Honestly, looking at the map more with the roads added to the sides, I think the two trees to the start zone's right work. Nevermind my tweak/suggestion. -Map 2: I like this one a lot. Probably my favorite of the 3 (but all 3 are good). I really like the raised middle sand section, I think it's a cool look. 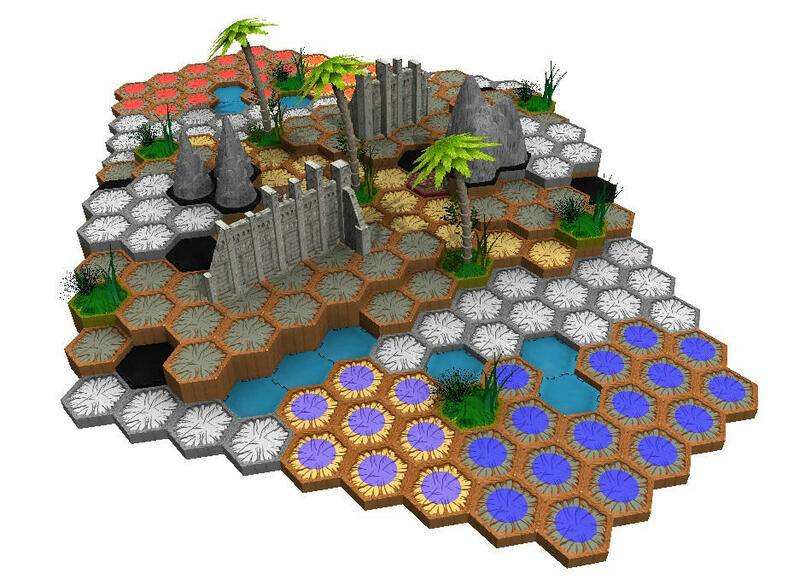 Also really like the safe-hexes behind the ruins sectioned between the water spaces. Jungle and shadow space placements are good. 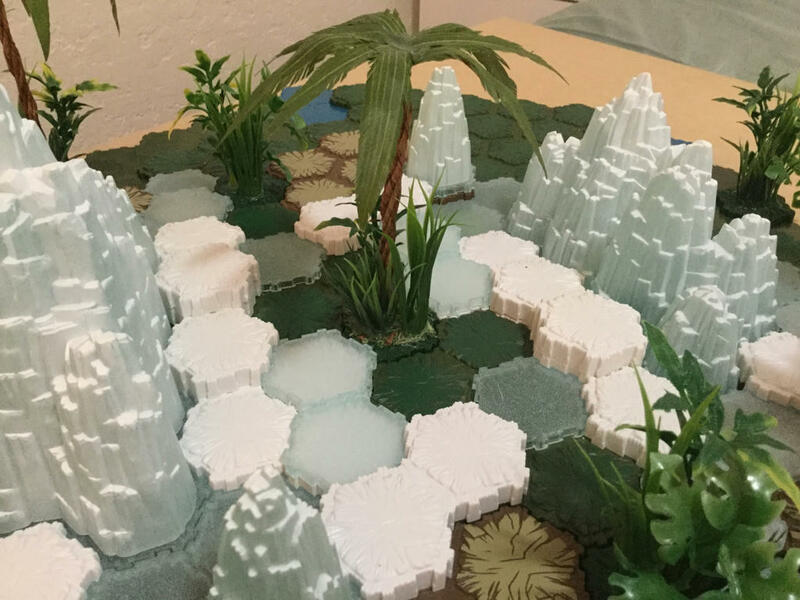 I think I would add another level (like a 3-hex or 2-hex) somewhere on top of the highest dungeon spaces on the map (the six spaces on each side), but I don't know whether you have hexes to spare. Also, I think it works fine as it is. -Map 3: With Haukeland Marsh (final), nothing really to complain or tweak here, looks very solid. I like the evergreen tree placement. I think the middle part with the low bridge will provide very interesting play - that's probably my favorite part of it. The water between the ruin and palm tree will probably see play too, if a player closes off both roads at either side of the ruin and forces the other player to move through that chokepoint to enter into the start zone. All in all great maps Flash. I just checked it out. It looks like a really fun play style - I love the idea of stealing treasure from the dragon. I will say, I think Brax could go down really fast - I might beef him up a little bit. Maybe boosting his defense/life stats. And maybe you could offer an extra VP for taking down the dragon? Have you tried out the d-20 mechanic that helps you know what unit to target with Brax when there are multiple units around? I imagine you just use the d-20 and whichever figure rolls the lowest is targeted by Brax? 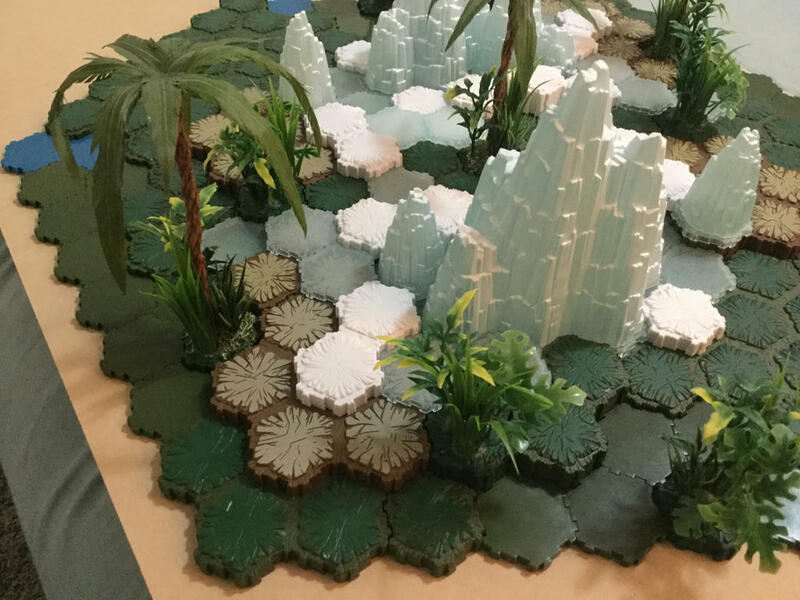 Really cool idea - I think it sounds fun to design a multiplayer map designed around this kind of play style - stealing treasure from a dragon protecting it. Good work! Thanks for the feedback, Cleon! I really appreciate you taking time to share your thoughts. I actually still need to playtest maps one and two - so I'll definitely keep your suggestions in mind when I get around to playtesting and making changes afterwards. Thanks! 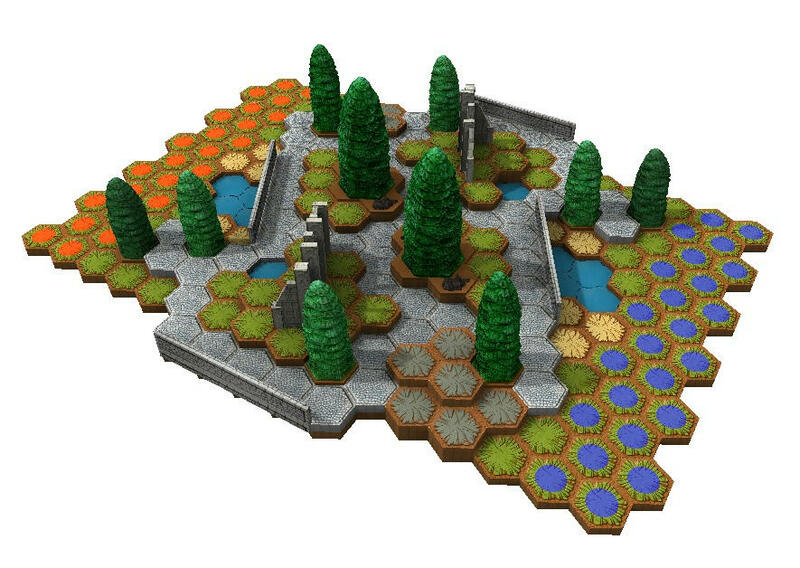 Still tweaking the armies, and may choose another map . . .
Re: Flash_19's Maps: New Map 10/17/18! I'm liking the look of this one! Got it built to play, but unfortunately, couldn't get the game in. Power glyphs would be out on the sides on level 1 swamp terrain. 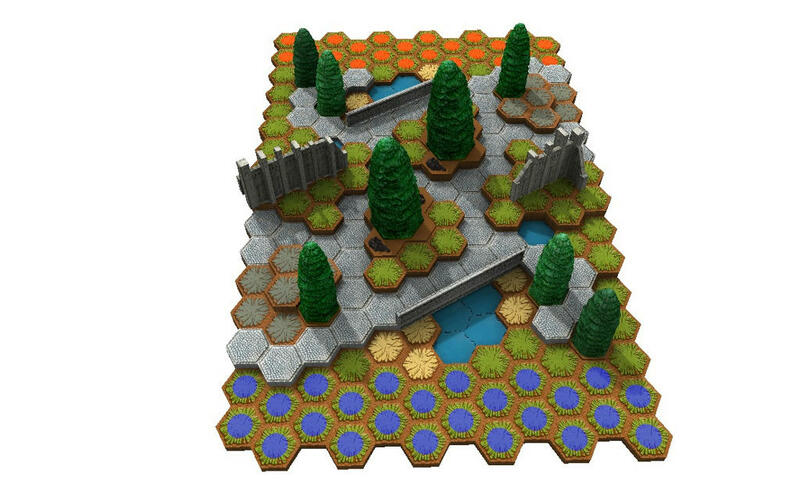 Start zones would be the last 3 rows of hexes on either side. That map looks awesome. Any glyphs? 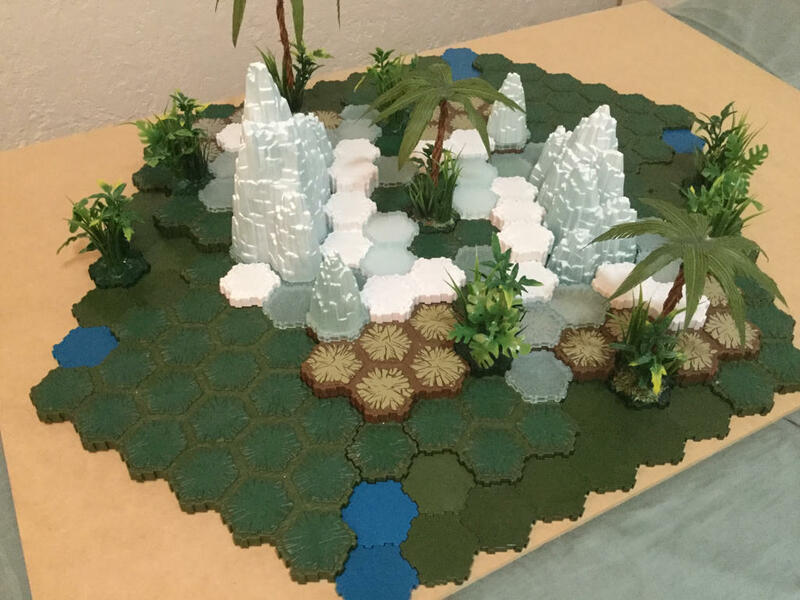 I think putting a glyph on the swamp 7 hex on each far point would do the trick (the spaces that are right adjacent to to sand 7-hex that's one level higher). Also does it use normal or heavy snow, and normal or slippery ice? SoTM + TT (w/ or w/o TJ) is an underrused map type, and one I love building maps of. 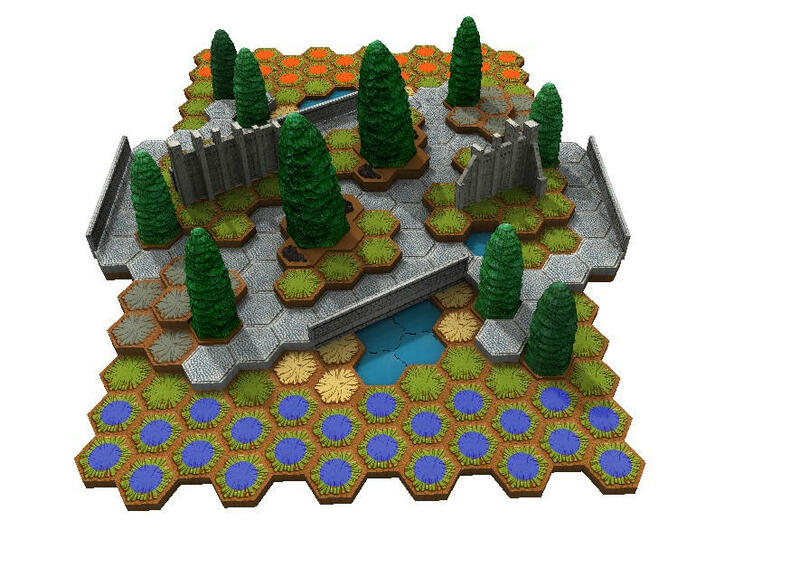 The abundance of 1- and 2-hexes from TT helps tremendously because SotM has so few unfortunately. TT + TJ is another thing you don't see much of, but I think it balances well being that heavy/slippery snow/ice usually favors range and TJ usually favors melee (or at least helps melee, to balance). Thanks! Yeah, glyphs are going exactly where you thought they should go. That was actually why I built this map - cuz I felt the same way about the underuse of SoTM and TT together. 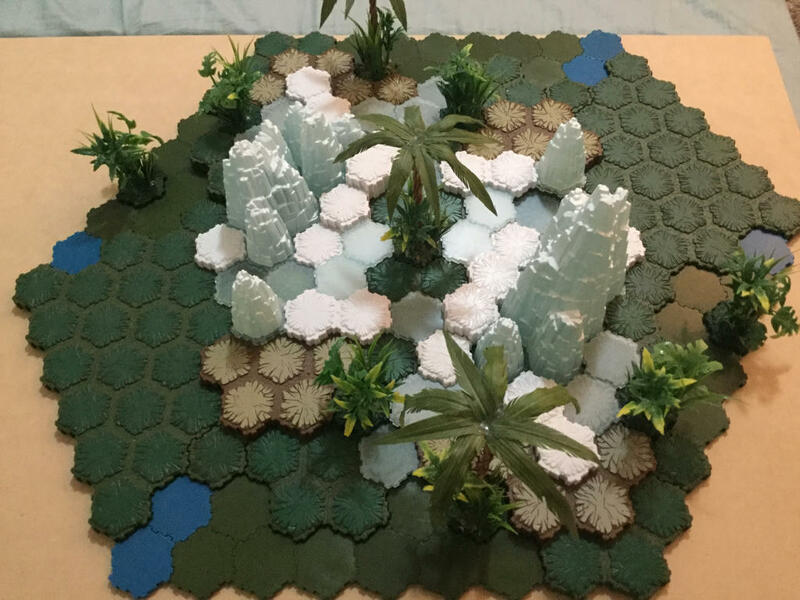 Yeah, that's my biggest gripe with the SoTM terrain - it needed more of those smaller hex pieces. I actually haven't decided on the snow/ice rules. I'd most likely choose either normal ice and snow, or else normal ice with heavy snow. And of the two, I'd lean towards normal ice and snow. I have a hard time with both heavy snow and slippery ice for the reason you stated - I think it tends to give range more of an advantage. I'd love to hear what you think though considering the map layout and size. Unless there's a very specific reason for heavy snow/slippery ice, I think it's generally advisable to just keep it normal. I always find it very frustrating to play with heavy snow/slippery ice. Lava can be frustrating too sometimes, but at least lava is fun. Heavy snow/slippery ice, beyond just being tedious, favors range and makes the game last longer. good thoughts - thanks for chiming in. I think the only reasons I'm even considering it is because of the small map size, and the snow isn't too prevalent on the map. But, I'm pretty positive I will just leave it normal regardless. I actually would go with Heavy Snow and Normal Ice. I think the map would work great that way. It's a close map, each start zone is very close to that middle section, so I think the snow will help slow down getting to those high points too early, and I don't think it hurts melee. With the jungle and the ice pathways, I think doing heavy snow would work quite well. Normal snow probably works too, I assume, but I'm liking heavy for this one. Normal Ice obviously. You don't want to those paths to the middle and from the sides. Yeah, definitely normal ice - but I think the Heavy Snow is for sure worth trying out for the reasons you mentioned. Thanks for sharing your thoughts! I"m excited to see how it turns out. Didn't you say on your map thread that you had a bunch of maps to post? I'll be looking forward to looking through them as well.